Now that summer is over—and hopefully the record-setting 2017 hurricane season—many of us can turn our attention to the cooler temperatures, shorter days and the colorful splendor of autumn leaves. Of course, all of those red, orange, and yellow leaves are short-lived and fall to the ground, forming truly massive amounts of organic debris. 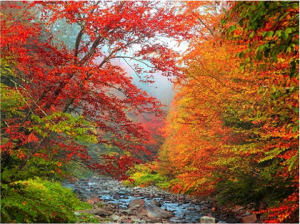 But did you know that this yearly spectacle, and all that leaf litter, can have a negative effect on water quality? Prior to the 1970s, most “urban leaves” were burned in yards and provided the unmistakeable smell of autumn … to the marked disadvantage of air quality. Beginning in the early 1970s, many cities banned the open burning of leaves and some eventually began collecting leaves at curbside. In 1972, the National Science Foundation funded a group of 12 students (myself included) to consider alternatives to burning leaves in my hometown of Louisville, Kentucky; we investigated their conversion into carbon, fertilizer and even biodegradable replacements for polystyrene foam cups used for fishbait. 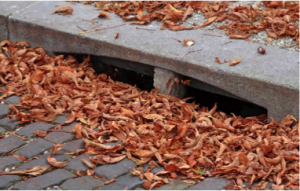 Today, a major concern is that leaf litter (i.e., organic debris) spikes stormwater systems and watersheds with nutrients during and after rainfall, especially when it gathers along street curbs. Excess phosphorus and nitrogen often lead to major water quality problems for municipalities, a process called eutrophication,1 and harmful algal blooms (HABs), such as those that plagued the Lake Erie source of drinking water in Toledo, Ohio, in 2014. Overgrowth of blue-green algae (also called cyanobacteria) is particularly problematic because it not only can deprive the water of oxygen,2 but also can release toxins that are both difficult and expensive to remove during the drinking water treatment process. The sources of nitrogen and phosphorus are many and varied, but leaves that fall on streets and into catch-basins during autumn can add to the nutrient problem in urban streams and lakes—particularly in subsequent summer months that also support conditions for HABs. The connection between fallen leaves and excess nutrient loading may appear intuitive, but the impact on urban water quality, including release of organic compounds, is not fully understood. A U.S. Geological Survey researcher named William Selbig reported on research conducted during the months of April through November, 2013 to 2015, in Madison, Wisconsin.3 He noted that “While the sources of nutrients to urban stormwater are many, the primary contributor is often organic detritus, especially in areas with dense overhead tree canopy … making source control through leaf removal one of the few treatment options available to environmental managers when reducing the amount of dissolved nutrients in stormwater runoff.” Moreover, the findings are applicable to any urban areas that are required to reduce stormwater-associated nutrient loading, such as through a Total Maximum Daily Load or TMDL. Selbig’s research demonstrates that community leaf removal can significantly reduce the concentration of nutrients—particularly phosphorus—that reach streams and lakes through street stormwater drains. However, timing is important for optimal nutrient mitigation. The City of Madison collected leaves and cleaned the streets once per week, but would also endeavor to do so prior to a predicted rain event. Consider mulching in-place with your lawn mower, especially if your yard is relatively flat, and those nutrients will soak into your lawn.4 And it’s probably easier than raking! Gather leaves and other “yard waste” into a compost pile for use next spring to fertilize flower beds and vegetable gardens. If you know when leaves will be collected for your community, wait to rake them close to the street until just before collection time. If you have curbside leaf collection, rake leaves near the edge of the street (keep about three feet of lawn between the curb and the pile) but not into the street. The soil under the leaves will adsorb some of the nutrients when it rains. Keep leaves off driveways, sidewalks and other impermeable surfaces. Keep the streets and catch-basins free of leaves … they usually lead straight to a stream! Steve Hubbs retired from water treatment operations at the Louisville Water Company in 2004. His first scientific adventure was leading a National Science Foundation student project looking into alternatives for leaf disposal following a ban on open leaf burning in 1972. 1 Eutrophication is the enrichment of an ecosystem with chemical nutrients, typically compounds containing nitrogen, phosphorus, or both. https://www.sciencedaily.com/terms/eutrophication.htm. 2 As HAB cyanobacteria cells reproduce, others die, becoming food for bacteria that decompose organic matter. This overgrowth blocks light and uses up the dissolved oxygen in the water to the point where other aquatic organisms like fish and insects cannot survive. https://www.sciencedaily.com/terms/algal_bloom.htm. 3 Evaluation of leaf removal as a means to reduce nutrient concentrations and loads in urban stormwater. https://pubs.er.usgs.gov/publication/70175058. 4 Skip the rake and leave the leaves for a healthier, greener yard. https://www.treehugger.com/lawn-garden/skip-rake-and-leave-leaves-healthier-greener-yard.html.